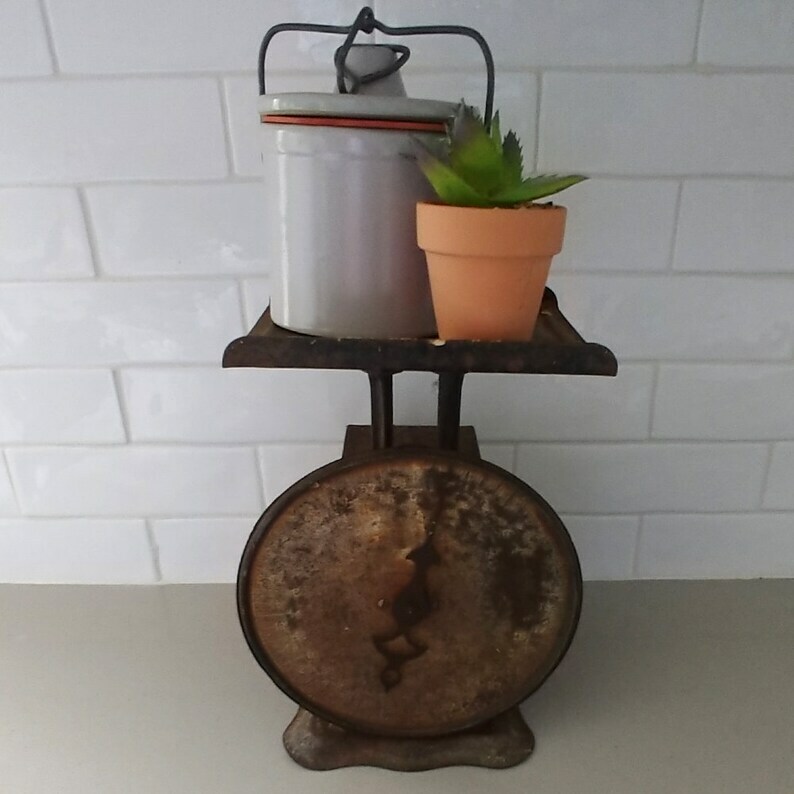 This antique 24-pound kitchen scale, rusted to perfection, is visually appealing and ideal for that rustic farmhouse decor. It was made by the Pelouze Scale & Manufacturing Company in the early 1910s and found on the floor of a 100+ year old barn. With a face only a rust-lover could love, this scale still works! The arm rotates around the face smoothly when weighted and the white numbers and marks are visible against the contrast of the rust. This scale shows the remnants of the Pelouze logo on one side. The scalloped metal base and the body of the scale were once all shiny black (as evidenced by the bottom) but much of the paint has chipped away to reveal the rusted metal. The scale has been cleaned leaving the rusted surfaces intact. View the phots carefully for details of age, wear and tear. The scale is 10 inches tall, 6.5 inches wide and 8.5 inches deep.